October is NICE Preorder Month! 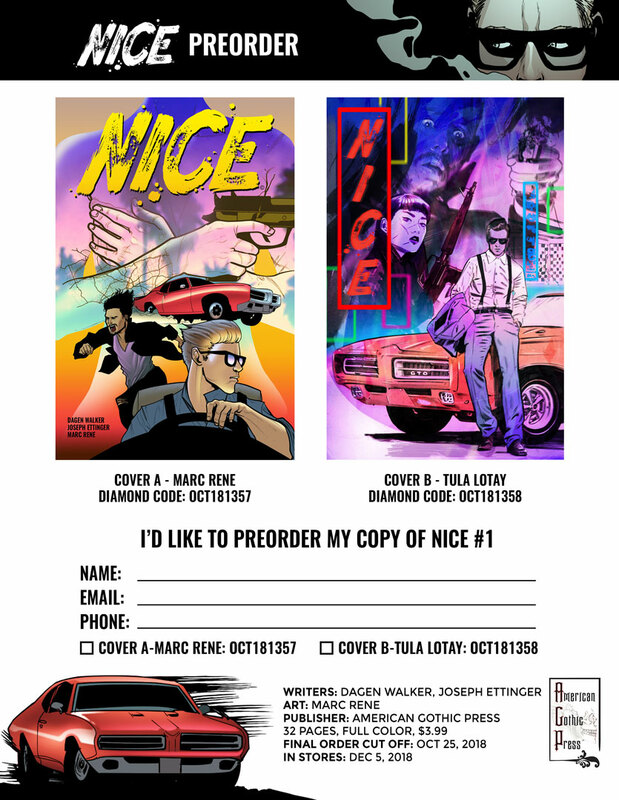 Attention AGP fans: the first issue of NICE is now listed in the October issue of DIAMOND PREVIEWS! Unless you’ve been out of the loop for a few weeks, you’ll know that NICE is our first major new series since the 2017 Northern California wildfires, and we’re bringing it in with a bang! It’s the debut of our special collaboration with Echo Lake Entertainment, who are coincidentally celebrating their 20th anniversary in the film business this year. Offer your congratulations by using the form below to tell your local comic shop to order the book. Important note: If you have a physical copy of previews, you might notice that only Cover A is listed. We are happy to announce that Tula Lotay’s variant cover will now be offered as a COVER B option rather than an incentive, allowing you to order as many copies as you like! We love both Lotay and Marc Rene’s art so much that we decided to let customers have the cover of their choice (or both!). Don’t have a comic shop? Find the closest one to you here!